Finally an affordable and unique decorative floor register. These Accord floor vents feature an organic floral design and plastic adjustable drop in damper. Find 5 beautiful finishes. Find sizes 4x10, 4x12, 4x14 and 6x10 (sizes vary by finish). Beautiful decorative vent covers in a trendy rectilinear design. Each Accord floor register comes with a non-rust plastic damper for air control. Find the finishes satin nickel, antique brass and oil rubbed bronze register covers. Sizes 4x10, 4x12, 4x14 and 6x10. Decorative floor registers feature a honeycomb, geometric design that is one of a kind. Available finishes light oil rubbed bronze and satin nickel register covers. This Accord Ventilation Floor Register is sold in the sizes 4x10, 4x12, 4x14 and 6x10. These trusted brand Accord floor vents feature a unique geometric design, and are available in the sizes 4x10, 4x12, 4x14 and 6x10. Light oil rubbed bronze and satin nickel floor registers are constructed of a durable steel core. Classic wicker design floor registers available in a wide size range from 2x10 to 6x14, and even the size 3x10 is available. The Wicker floor vents are available in the beautiful finishes satin nickel, polished brass, oil rubbed bronze and antique brass. Durable Marquis floor registers by Accord Ventilation. 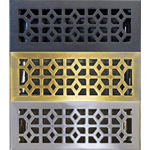 These beautiful decorative vent covers are available in antique brass and satin nickel plated finishes and cast iron pewter. Sold in sizes 4x10, 4x12, and 4x14.